Welcome to Part I of BaseballHQ.com’s 2014 consistency series. Our goal is to provide you with the ability to find players who, week in and week out, will have the most consistent production this season. While it is not too difficult to find consistent players at the top of your draft, Part I of our three-part series focuses on where you can find 2014 draft values. We also highlight those players that are better suited for the rotisserie game. Quality-consistency scores (QC scores) provide us with a convenient measurement of how consistent a player is. The formula is: (DOM% - (2 x DIS%)) x 2. A player earns a DOMinant week if his BPV is greater than or equal to 50. A player achieves a DISaster if his BPV is less than 0 for a given week. A week where a player’s BPV is between 0 and 49 is neutral. Players are scored on a scale of 200 (perfect) to -400. A complete list of 2013 QC scores can be found here. That is not a mistake at the top of the list. 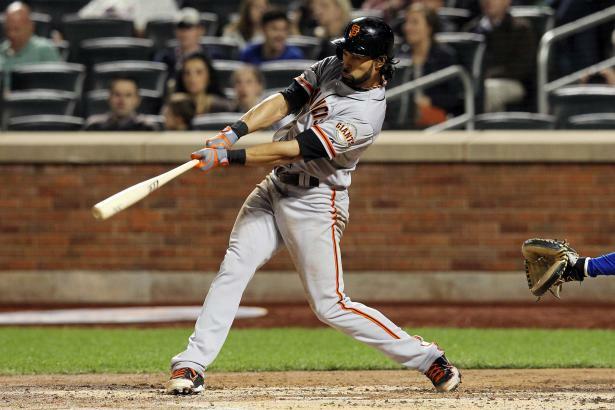 Angel Pagan (OF, SF) was fantasy baseball’s most consistent performer in 2013. His three-year record of QC scores (74-58-158) suggest that while he may not duplicate his 2013 score this year, he is still is likely to provide late-round consistent value. Interestingly, consistent production at the top fell off in 2013. In 2011, there were 20 players with QC scores over 100. In 2012, there were 19 players with QC scores over 100. In 2013, just 13 players met this elite threshold. It will be interesting to see whether 2013 proves to be an aberration. Demographically, fantasy baseball's most consistent performers are generally older players. The average age on the above chart is 29.6. Nine of the thirteen players listed are 30 or older. While fantasy players have a tendency to reach for the shiny new toy on the block, this list suggests (not surprisingly) that experience yields more consistent performance. When approaching your 2014 drafts, pay particular attention to those players that offer more consistent performances in the later draft rounds. Typically, the players available in the mid-to-late rounds of your draft offer inconsistent head-to-head production. Teams that drafted consistent performers early can destroy their team's otherwise consistent nucleus by drafting inconsistent players late. Focus on QC scores as the draft progresses so that your team does not suffer the same fate. There are many diamonds in the rough to be mined through our 2013 QC scores. And the best way of doing so is to look at which consistent players provide the best values based on their 2014 NFBC average draft positions (ADP). Please note that all rounds referenced below are based on a standard twelve team head-to-head league. The players with the top 5 QC scores are highlighted. Best consistent value picks: Jonathan Lucroy (C, MIL) (QC score of 68) and Wilson Ramos (C, WAS) (QC score of 54), are the standouts at the catcher position. If you miss out on the extremely consistent Posey and Santana, Lucroy should be the number one target with his 7% DISaster score and eighth round ADP. Ramos is not being drafted until the thirteenth round. Better suited for roto: HQ projects a rosy 2014 outlook for Wilin Rosario (C, COL), but with a -24 QC score, it might be a bit of a roller coaster ride to achieve those numbers. Let a league-mate grab him as the projected third catcher off the board. Best consistent value picks: Overall, first base had some of the most reliable hitters in 2013. Anthony Rizzo (1B, CHC) and his elite QC score of 98 are still available in round twelve. Joey Votto (1B, CIN) (134) and Edwin Encarnacion’s (1B, TOR) (136) QC scores show that they are worthy of an early draft investment. In round five, target the improving Eric Hosmer (1B, KC) (68), who in the second half of the season had a 0% DISaster rate and a 134 QC score. Better suited for roto: Mark Trumbo (1B, ARI) may be an upper echelon power source, but with a QC score of 0, and a 2012 score of -44, he is not suited for the head-to-head game. Best consistent value picks: At second base, the QC scores show that the best values are in the middle rounds with Matt Carpenter (2B, STL) (82), Ian Kinsler (2B, DET) (118) and Ben Zobrist (2B, TB) (66). Omar Infante's (2B, KC) QC score of 82 offers great late round value, but be wary of a repeat, as his 2011 and 2012 QC scores were 52 and 16, respectively. Better suited for roto: Let someone else use a second round pick on Jason Kipnis (2b, CLE). He had a DISaster rate of 44% and has had two straight second half collapses, as noted in the Baseball Forecaster. Best consistent value picks: Brad Miller (SS, SEA) had the fourth highest QC score among qualifying shortstops and is available in fifteenth round. Jed Lowrie's (SS, OAK) QC score of 106 was the eleventh best in the league in 2013. However, his F health score should give you pause. Andrelton Simmons (SS, ATL) also offers an elite QC score (90), and 20 homerun upside. He is a great pick in round thirteen. Better suited for roto: Ian Desmond (SS, WAS) is coming off two consecutive seasons of .280+ batting average and 20 home runs. But his 3-year QC scores of -148, -40 and -24 demonstrate that you cannot rely on him on a week-to-week basis. His instability does not merit an early fourth round pick. Best consistent value picks: If you miss out on the two elite options at the top, don't sleep on Martin Prado (3B, ARI). His excellent QC score of 118 was no fluke based on his 2011 and 2012 scores of 88 and 98, respectively. In the ninth round, he can help balance out some of the more volatile performers on your team. While Aramis Ramirez's (3B, MIL) health is a concern, in the fourteenth round, he provides good value. Better suited for roto: Pedro Alvarez (3B, PIT) has elite PX and xPX scores, and 40 homerun upside, but with a QC score of -24 (and '11 and '12 scores of -60, -186), it's clear his value comes in streaks. The players with the top 10 QC scores are highlighted. Best consistent value picks: There are some solid mid-round performers here, like Carlos Beltran (OF, NYY) (QC of 82) and Jason Werth (OF, WAS) (72). In the later rounds, target Kole Calhoun (OF, LAA) (60), Norichika Aoki (OF, MIL) (96) and 2013's QC King, Angel Pagan (OF, SF) (158). Just don't pay for a repeat performance from Pagan. Better suited for roto: Both Upton brothers' QC scores (-20 for Justin and -264 for B.J.) scream avoid. Somewhat surprisingly, Carlos Gonzalez's (OF, COL) -80 QC score, coupled with a score of 8 in 2012, suggest that he's not a great head-to-head team anchor. Jay Bruce's (OF, CIN) three-year QC scores of 0, 22 and -16 probably seems about right for those who have owned him, and he's too volatile to take in the early third round. Michael Bourn (OF, CLE) is another player whose three-year QC record of -98, -92 and -168 make him a head-to-head avoid. When constructing your 2014 head-to-head team, apply a value-based QC draft strategy. By using mid and late round draft picks on consistent players, you can (1) balance out some of your team's more erratic performers, and (2) obtain an advantage over those teams in your league that are not focused on consistency in these rounds. In Part II of our series we will focus on those players who could see their QC scores rise in 2014, and where to target them in your drafts. This will help expand your player pool of potential consistent draftees. There’s more where this came from. Click here to purchase a Draft Prep subscription plan, which gives you complete access to BaseballHQ.com's insights through April 30, 2014.